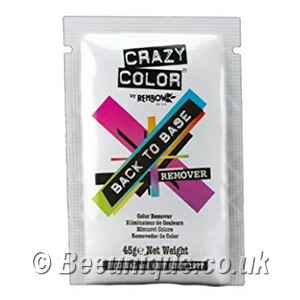 Crazy Color Back To Base Colour Remover is a new product added in June 2018. This is an easy and gently way to remove dye from your hair and bring it back to your pre-dyed blonde shade. Pack is a 45g powder kit you can mix with your required volume of developer and leave on the hair for upto 30 minutes to remove the old dye. Perfect for when you fancy a big change or simply want to go back to your pre-dyed colour for a while. 1. Use a non-metallic bowl to mix the full sachet of Crazy Color Back To Base with developer – you can use 5, 10 or 20 volumer depending on your needs and hair condition. 4. Rinse, shampoo and condition as normal. At the moment Crazy Color are saying this is only for use with Crazy Color hair dyes however most manufacturers say that about their products e.g. directions shampoo is for directions hair dyes, stargazer bleach to be used before stargazer hair dye etc. Due to the way this colour remover works I would assume it should be ok for all semi-permanent hair dyes but as it is a new product we don't have a lot of feedback on it so cannot say 100% it will work on your permanent hair dye. Have you thought about a bleach bath instead? There is a guide to this on our forum: https://www.hairdyeforum.com/index.php/topic,995.0.html and a search on youtube also gives information on how to do this - it's gentler than a full bleaching.